The Irish Times has always been regarded as Ireland’s “Newspaper of Record” – never mind its minority protestant-nationalist and then unionist origins or the fact that the Irish Independent (and the defunct Irish Press) generally outsold it by a considerable margin. Now Irish Times hardcopy sales are declining at 8% p.a. and it is desperately searching around for new sources of influence and revenue. To its credit the Irish Times pioneered on-line newspaper publication in Ireland, first as Ireland.com, and then as Irishtimes.com. The attempt to introduce a pay wall to garner more revenue foundered with a rapidly declining on-line readership and so it reverted to a free site with, a subscription required only for archive material and its E-Paper – a clunky facsimile of the hardcopy newspaper, presumably intended for those who like the hard-copy experience but can’t get their hands on the hard copy itself on a regular basis. Nevertheless the ‘free-to-air’ Irishtimes.com regained its position as one of the primary Irish news sites with a wide and varied readership. There were problems with the old site – many stories were only uploaded overnight once the print edition was published. Articles were generally not tagged, which meant it could be extremely difficult to re-find that article you read yesterday or last week, unless you could remember its exact title or author. Its use of hyperlinks to relevant sources and linked articles was sporadic at best. Comments by readers could sometimes be lost when the moment came to push the “post” button – or appear unpredictably some time later. But the overall look and feel of the site was suitably information-dense for a broadsheet newspaper of record, and gave its content the authoritative aura the Irish Times had built up over many years. You might disagree with what an article said, but you knew that it was important because it had appeared in the Irish Times: many people would read it and its content would help shape national perceptions and debate on any given subject. The re-launch – into the Facebook generation? And then the Irish Times went and changed all that and launched an almost entirely new site on March 9th – and all hell broke loose amongst its dedicated users , as evidenced by almost 300 generally severely critical comments on the site itself and other online discussion boards. Conscious of the fact that a majority of readers would soon be reading it on mobile or tablet devices, the Irish Times sought a more “responsive design” and one that could more easily be read on smaller screens. The problem is that in doing so, it dramatically reduced the amount of information displayed on any one screen and those users viewing it on a desktop or laptop – still the majority – are presented with a screen filled with pictures, advertisements and empty spaces, and very little actual news or editorial content. It is almost as if the broadsheet paper of record has been reduced to a Facebook page, full of photographs and one-liners, and very little substantive information. Gone is the sense of what is happening in the world on a single page. You have to scroll and scroll, and dig down into many layers of menus to find the story you want, or to see if there is any new coverage in your particular area of interest. It gets worse than that. Intrusive advertisements and “drop down on hover over” menus appear at every opportunity and an ill-timed or involuntary click, as the menu drops down, gets you to a place you never intended. Never has the browser “Back” button been used so often by so many to so little productive effect. But perhaps the worst problem is that the site now has virtually no visual connection with the printed paper itself. It doesn’t look or feel like the printed Irish Times, or indeed any authoritative, information-dense newspaper of record. All you have as a reminder of where you are is a small “The Irish Times” logo at the top of the page which disappears as you scroll down. Lest anyone think this is a silly traditionalist or stick-in-the-mud complaint, it actually has some rather profound reputational, branding and psychological implications: If the site you are on looks virtually no different from a plethora of other news sites, the information it contains becomes essentially just another generic “yellow-pack” commodity, no more reliable or important than what you might find in any random Google search. You read it with a much more critical eye, and dismiss it much more easily. We are presented with information overload on the internet with many news ‘consumers’ frequenting a wide range of newspaper, TV, community blog and social media sites. How do we determine what is truly important, insightful and likely to be very well written? We go to sites and authors that we trust: trust that has been built up over many previous reading and sometimes commenting and discussion sessions. This can be a named author like Paul Krugman, the Nobel Prize winning economist and columnist for the New York Times. Or it could be a brand you trust like the New York Times itself. The point is, you immediately know – subliminally – that you are on the New York Times site from the look and feel of the site itself – and you see and read everything there in the light of your previous experience of that site. Read the same article on an anonymous vanilla site, and you won’t give it anything like the same credence, time and attention. Read it on a site you actively dislike – e.g. www.dailymail.co.uk/ – and you won’t even give it the time of day. This is a phenomenon that marketers have long known: in a blind wine tasting even the experts often can‘t tell which is the €10 bottle and which the €100 bottle. But these same connoisseurs will argue long and hard over the merits of the €100 bottle when they can see and feel it. Many will of course argue that each and every article should be read with a critical eye and judged strictly on its own merits. But in the real world, who has the time? The whole point of branding is that it is a proxy for a critical analysis of every individual interaction with a product or service. You know you generally like a particular brand and so your default position is to trust other products in that brand range. Occasionally you may be disappointed, and if this disappointment is repeated you may change your mind about the brand range as a whole. But when you select and read hundreds of news and opinion articles from many sources in the course of a week – from a potential universe of millions of articles on the internet – you have to take short cuts. So you have favourite authors, and websites, and you know you are there because there are many visual cues telling you this is from a favoured source you have come to enjoy or trust. Irishtimes.com used to be a brand extension of the Irish Times itself. Now it is difficult to know what it is trying to be. Irish Times online editor, Hugh Linehan writes of differentiating the online from the hard-copy version of the paper, which is fine as far as it goes for the different technical capabilities and limitations of various online platforms. But if you distance Irishtimes.com from the Irish Times brand, you have to create a new brand identity, with different content, target markets and advertising strategies, and that is a major and costly undertaking in its own right. So what is the target market for the new Irishtimes.com? Some cynical observers have opined that the Irish Times is aiming Irishtimes.com at a youthful Facebook generation who want photographs and one-liners – and who wouldn’t buy a hardcopy of a broadsheet in any case – and in the process force its older more “serious” readers to go back to buying the hard copy. But this ignores the fact that many Irishtimes.com readers are from the Irish Diaspora who couldn’t buy a hard copy on a regular basis in any case. It also ignores the fact that existing Irishtimes.com readers have many other online news sites to go to if Irishtimes.com no longer serves their needs or meets their tastes. Advertisers will not be slow to depart the Irishtimes.com if they sense that many of the more serious (and often moneyed) readers are heading elsewhere. Speaking of advertising, many users commented on the ubiquitousness and obtrusiveness of advertising on the new site. Irritating ads damage brands. If the same ad for a product you don’t want keeps flashing across your mindspace you will quickly form a very negative opinion of that company in general, even if it also produces products you do want. 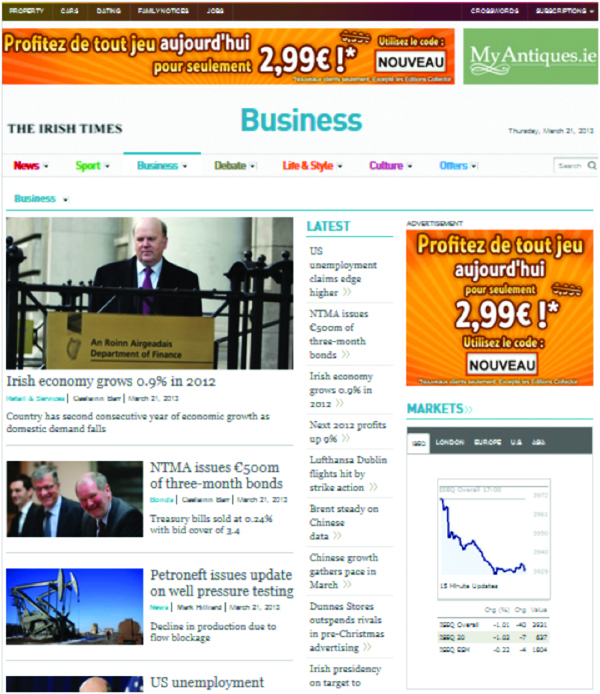 Other than some ads which change depending on the international IP address of your internet connection (with the example above incorrectly targeting French-language ads at a Spanish-located laptop) the new Irishtimes.com still uses a blunderbuss advertising approach throwing the same ads at all users/readers as if they were all one undifferentiated mass. This lack of personalisation applies to the Irish Times content as a whole. You cannot create a “MyIrishtimes.com” personalised home page with a “Favourites” list of your favourite tags/topics, authors or content areas. The new Irishtimes.com site also a missed opportunity to provide functionality that is increasingly becoming the norm on the internet and which is required to build an online community loyal to the brand. The old paradigm of newspapers being a medium through which professional journalists provided expert, privileged, exclusive or highly informed information and commentary to readers in a one way process is dying. Some readers come for the bunfight in the comments section at the end of an article. Unpaid bloggers or citizen journalists are increasingly providing highly insightful, specialised and expert analysis and content in lead articles on many sites like Daily Kos or the Huffington post in the United States, the European Tribune in Europe, and the Journal.ie in Ireland. Information flows have become multi-directional – between journalists and readers, readers and journalists, and readers and other readers. This can create an online community and a fierce loyalty to the brand. It also creates the sort of users who spend a lot of time on the site – the sort advertisers are more likely to pay for. But the new Irishtimes.com site provides almost no new functionality for active readers/contributors and bloggers. Comments threads can still only be nested down one level, which means it can be difficult to follow which comment is a direct answer or response to which prior comment. It is impossible for commentators to find all their comments on various comments threads in one place and thus keep track of the conversations they are having. You cannot see who is “liking” or responding to your comments all in one place. As a result many comments and excellent responses are lost in the void, never to be seen again even by those who wrote them. The search feature on the new Irishtimes.com site is so bad many users resorted to vanilla Google searches outside the website in an effort to try and find that article they had read and enjoyed or commented on a few days ago. A lot of the usual content was simply missing. Many articles now require clicking on “next page” and “more” buttons to get to the bottom of the article or comment thread which means the user is continually moving the mouse cursor back and forwards from the scrollbar to the “more” button and running the risk of triggering unwanted popup menus or advertisements every time s/he does so. Many of the most contentious – and tendentious – comment pieces have no comment boxes enabled beneath them. It seems only one opinion is allowed. The new Content Management System (CMS) at the heart of the new site has the Irish Independent’s (Independent.ie) annoying habit of splitting words into fragments and hyperlinking fragments to often irrelevant content streams: Thus European becomes “Europe an” and Eurostat becomes “EU rostat” with the EU linking to all articles pertaining to the EU, and not specifically to Eurostat related articles. In fairness some of the above issues may have been teething problems during the transition to the new site, but this begs the question as to whether the site had been properly tested before going live. It certainly appears the website hadn’t been tested adequately on a variety of common phone and tablet devices and so it simply didn’t work as designed. It all smacked of a very unprofessionally-run website re-design and implementation project. Many readers will undoubtedly stay loyal and get used to the new formats and layouts. Many of the initial problems will be ironed out. But the Irish Times cannot afford to chase away a whole tranche of users to an increasing array of competing sites. Opportunities to attract and retain new users were missed. Above all there was no customer-relations or change-management strategy readily apparent to this writer. Users generally were never consulted on what new features they would like to see, or what attracted them most to the Irishtimes.com site in the first place. The new site was sprung on them without warning. The blogosphere has spoken on the Irishtimes.com, Broadsheet.ie and other bulletin board and online media sites, and it has not been a pretty sight. In fairness, Hugh Linehan, the Irish Times online editor, was assiduous in his responses to many of the views and criticisms and some have since been remedied. However the Irish Times still has a lot of work to do if it is to regain its pre-eminence as perhaps the most admired Irish on-line news site. Some might say “why all this whingeing at what is essentially a free service?” The answer is that it is anything but free. It costs a lot of money to build and maintain an up-to-date fully functional news website and unless you get a large volume of traffic no advertising or pay-wall model of business is going to be able to fund it – and then you risk the financial viability not only of Irishtimes.com, but of the Irish Times itself. Many users went to a lot of trouble testing and exploring the site in order to come up with not only reasoned criticisms, but also possible solutions to the issues raised. This demonstrates the fund of goodwill towards Irishtimes.com and the concern of readers that Irishtimes.com would make a success of the redesign. Building a loyal online community is a collaborative project: If you provide good substantive and up-to-date content, good collaboration tools, good personalisation capabilities and a safe, moderated, self-regulating blogging environment, a wall of free internet expertise and energy comes flowing your way. Regrettably, the new Irishtimes.com site still isn’t equipped to compete in social, dynamic, and mobile web world and may even have taken a step backwards with this unfortunate redesign.